New Matamoras OH – Ohio residents and allies from numerous environmental groups including Earth First! 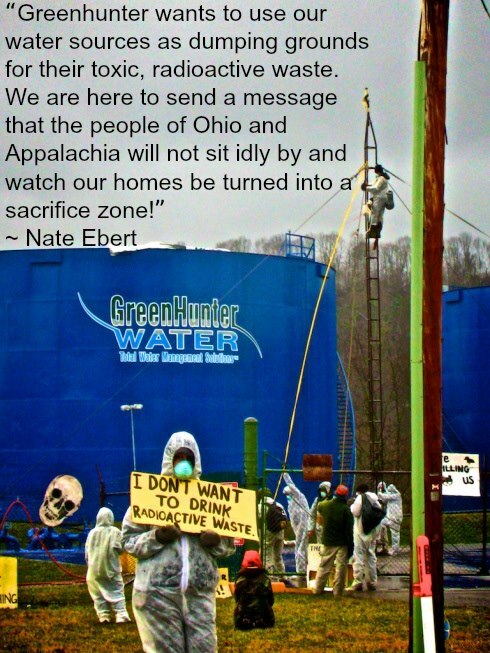 have disrupted operations at Greenhunter Water’s hydraulic fracturing or “fracking” waste storage site along the Ohio River in Washington County. 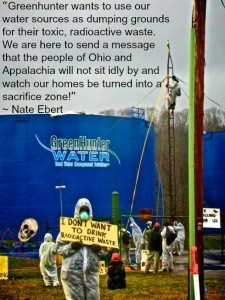 Nate Ebert, a 33-year-old Athens County resident and member of Appalachia Resist!, ascended a 30 foot pole anchored to a brine truck in the process of unloading frack waste, preventing all trucks carrying frack waste from entering the site. Over one hundred supporters gathered at the facility, protesting Greenhunter’s plans to increase capacity for toxic frack waste dumping in Ohio. Greenhunter is seeking approval from the Coast Guard to ship frack waste across the Ohio River via barge at a rate of up to half a million gallons per load. The Ohio River is a drinking source for more than 5 million people, including residents of Cincinnati and Pittsburgh. Test results from multiple frack waste samples reveal high levels of benzene, toluene, arsenic, barium, and radium, among other carcinogenic and radioactive chemicals. 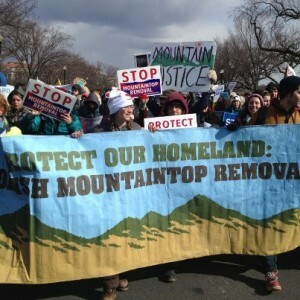 This Sunday, a RAMPS contingent joined more than 40,000 others at the Washington Monument for the Forward on Climate rally and march around the capitol. We marched in a unit with other mountain justice activists from all over Appalachia, representing our battle as a piece of the greater fight. Likewise, representatives from almost every justice struggle imaginable across the nation marched under their own colors, banners, and carefully chosen words. Sometimes coming together is hard. To be honest, marches in circles around DC aren’t really our style. But more important than what we did or where we walked on Sunday was that stood in solidarity with so many others from so many distant corners of the movement for environmental justice. Mountaintop removal is, among many other things, a climate issue. The climate crisis demands that humans come together in a way that we never have before, which means disciplining ourselves to a unity that defies many of the natural lines of affinity that we have been able to rally behind throughout the rest of history. Dustin Steele and Adam Hall of West Virginia and Fern Benally and Don Yellowman of the Navajo Nation of Arizona speak at length about living in the shadow of coal mining, their first-hand experiences with destructive corporate practices, the importance of community empowerment, the role of education and the fight to maintain self-determination and a sacred connection to their land and culture. In the second part of the interview, these resisters share their inspiring stories from frontline communities who stand up to the injustice of coal companies every day, issue a call for solidarity in the struggle against extraction everywhere, and together, envision a better future for future generations without coal. Hear their stories, and join in their struggle.